Today hundreds of demonstrations and fast food strikes will take place across the US to bring the fight against low wages to the forefront of national politics. The “Fight for $15” and union rights has rallied support around the country over the last year, far outstripping the expectations of SEIU (Service Employees International Union) and others who initiated the protests. Several one-day national strikes have taken place in dozens of cities, involving thousands of workers winning broad public support, particularly among people of color and youth. Facing pressure from below, yesterday Obama delivered a major speech saying the gap between rich and poor was “the defining challenge of our time” and again called for raising the federal minimum from $7.25, though failing to say by how much. Previously Obama indicated support for a Senate bill to raise the minimum to $10.10 over several years. Any rise in the minimum wage would be welcomed by most workers, but Obama’s proposal falls far short of what’s needed to seriously tackle historic levels of poverty and inequality. The President’s main motivation is not genuine concern over poverty wages, but rather to provide a distraction from the Obamacare website disaster and to re-energize the Democratic Party’s frustrated, demoralized base in preparation for the 2014 midterm elections. In SeaTac (Washington State, close to Seattle) voters just passed a $15 minimum wage, standing up to a million-dollar corporate smear campaign in this small Seattle suburb. This historic vote in SeaTac is coupled with the tremendous impact of Kshama Sawant’s election to Seattle City Council. Running as a Socialist Alternative candidate with the call for a $15 minimum wage as her signature demand, Sawant won over 90,000 votes to defeat a 16-year Democratic incumbent. Today these two victories for the labor movement are linking up to bring the fight for $15 another step forward. There will be a long march from SeaTac to Seattle City Hall, capped off by a speech from Kshama Sawant on her proposals for a major joint campaign to win $15/hour minimum wage in Seattle in 2014, bringing together a coalition of labor and grassroots organizers. This precedent setting campaign in a major US city will be ferociously opposed by big business nationally, who will likely spend millions to see Sawant’s initiative defeated. The movement against low wages has put pressure on the establishment to increase wages throughout the country. Black Friday also saw exciting actions and civil disobedience across the country against Walmart and other low-wage employers. With union rights are under attack and most labor leaders failing to offer a way forward, the inspiring struggle of low-wage workers has the potential to become a central struggle to rebuild the unions. As the movement grows, Obama hopes to channel the struggle into the Democratic Party’s 2014 midterm election campaigns, to motivate their increasingly frustrated base. Unfortunately, many union leaders will help Obama create fresh illusions in the Democratic Party rather than into independent working class political challenges to both corporate parties. Alongside the pressure from below, this attempt to co-opt the movement explains the timing and character of Obama’s speech yesterday, and his vague call for a minimum wage increase. Socialist Alternative supports any gain in the living standards of working people. At the same time, we warn against placing any confidence in Obama and the corporate-sponsored Democratic Party. Workers must build our own independent political voice to really wage the kind of struggle needed to ensure all workers have access to living wage jobs. With the dysfunction in Congress and US corporate politics in general, workers should rely on our own strength rather than Obama’s empty promises. The President has railed against inequality many times before. Meanwhile, he has packed his cabinet with pro-corporate, establishment figures who worked with both Clinton and Bush administrations to design the neo-liberal, de-regulated economic system which caused the current economic crisis and widening wealth gap. Without mass pressure from below, Obama will not go beyond what his corporate handlers will accept. He will not move beyond rhetoric to wage a real fight for living wage jobs. At any rate, nothing the president or Congress is considering is nearly enough to solve the mass poverty and historic levels of inequality. According to a recent study on the “State of Working America” by the Economic Policy Institute, “Between 2007 and 2012, wages have decreased for the entire bottom 70% of earners despite productivity growth of 7.7%.” This comes after decades of wage stagnation. Meanwhile, CEO salaries have increased dramatically. 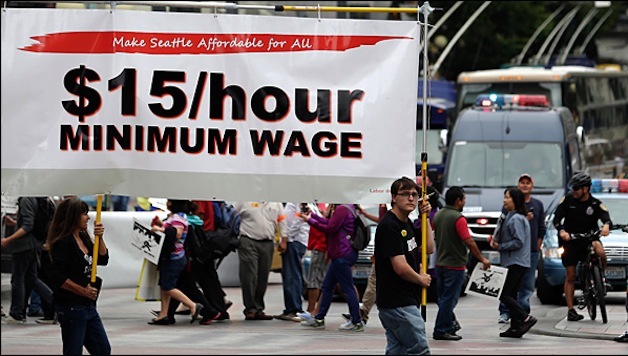 We need to step up the “Fight for $15” with another national day of action early in 2014. Labor leaders should develop a strategy, together with community activists, to build strong campaigns all over the US, forming neighborhood, campus and workplace action groups, using the victories in SeaTac and Seattle as a model. Continuing calls for low-wage strike action should be linked to mass campaigns for bold minimum wage legislation, ballot initiatives, and independent working-class candidates across the country. Socialist Alternative organizes for substantial wage increases, union rights and a green jobs program to put the unemployed to work and develop the economy. Yet big corporations will continue use their method of “economic terrorism” by threatening to move businesses and layoff workers when unions fight for higher wages or when workers push to raise the minimum wage. This shows the necessity of building a coordinated movement on a national and world scale that links immediate demands for higher wages with a clear socialist program to challenge Wall Street’s dominance and defend working class families against continuous blackmailing by big business. Corporations who threaten to destroy our communities by moving production or refusing to pay a living wage have to be taken into public ownership under workers’ control and management. The economy needs to be based on the needs of the millions not the greed of the billionaires. If the system can’t afford good wages and services, then we can’t afford this system! If you agree, we urge you to join Socialist Alternative.